An overhauled iOS app breathes new life into Spire, but it's still pretty pricey. Fitness trackers are a dime a dozen, but devices that focus on your mind instead of body are typically overlooked—mental health is incredibly personal and can be difficult to define, which makes it even harder to measure. 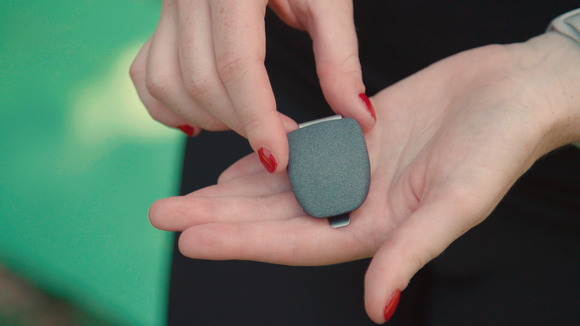 That’s what makes Spire, a breath -tracking device that aims to curb stress, stand out. This device was released in 2014 but got a boost this summer with an Apple Store retail presence and an overhauled iOS app, so I decided to give the company-described “mind and body tracker” a closer look to see if it really combats stress. Spire is a graphite-colored oval-shaped stone attached to a silver clip. You wear it on your pants or tucked inside your bra with the clip facing out. But its simple looks belie its more complex functions. “What does that thing do?” my boyfriend asked as he watched me slide the device onto the waistband of my workout pants. “Oh, it reminds me to breathe,” I replied without thinking. “Um…your brain already does that,” he replied. More specifically, Spire reminds you when to take deep, calming breaths in an effort to encourage more mindfulness. It’s also an activity tracker in that it counts your steps, but it’s not the best workout companion. It doesn’t have a display and it won’t urge you to run faster or get your heart rate up. Instead, Spire relies on its app to do the heavy lifting. 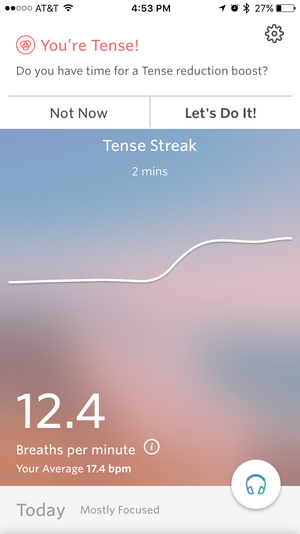 Spire’s home screen shows your breath in real-time. Setting up Spire is as easy as any other Bluetooth device. Make sure your phone’s Bluetooth is turned on, install the Spire app, and pair the device to your phone. Spire is a beautiful device. It’s too bad no one will see you wearing it. The stone has to be touching your skin, which I somehow didn’t realize until hours into fastening it to my pants with the stone facing outward. I didn’t have any issues with friction when the stone was pressed against my skin, not even when running with Spire clipped inside my sports bra, but you’ll definitely feel that it’s there. What Spire looks for is patterns in your breathing, which is why it has to be so close to your body. As you inhale and exhale, Spire tracks your chest movement, then sends that information to your phone. Your breathing appears in real-time on the app home screen as an undulating line. After you use the device for a few days, you’ll establish your individual baseline, so your breathing isn’t being compared to an average standard. Your breathing says a lot about your state of mind. Erratic breaths signal stress, while steady and slow ones indicate deep focus. Because the device doesn’t have a display, you’ll need your phone nearby at all times to receive notifications, which are endlessly customizable. You can set your Spire to vibrate and send you an alert when you’ve been sitting for too long, when you need to take a deep breath, when you’ve been intensely focused for awhile, or when you’re in a sustained period of calm. All of these reminders are designed to make you more conscious of your breathing and your state of mind. 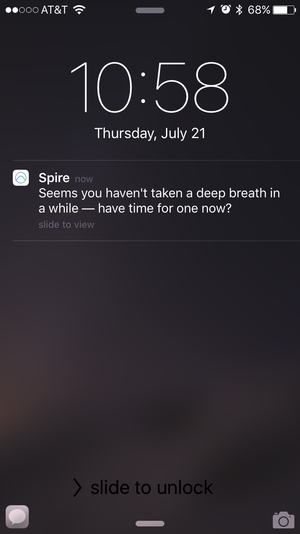 Spire’s notifications nudge you to focus on your mind, not just your step count. The app also integrates with your calendar, camera roll, and location, so you have a better idea of where and when you’re most stressed, focused, or calm. These integrations, which are new to the app, are a good start toward helping you figure out what triggers your stress before it happens. If a regular meeting with your boss throws you into tense mode, taking some deep breaths or meditating ahead of time could ease the stress. Spire also has an Apple Watch app, so I was getting notifications all over the place. This is how I realized I am an intensely focused person, which isn’t all that surprising. I’m rarely prone to panic, but I’m also not very calm. The device and watch app vibrated gently to remind me to take deep breaths when I was in the midst of a long stretch of focus. Guided meditative boosts, which are accessible in a different part of the app and range in length and topic, were calming, reminding me to release tension from my head and shoulders and take intentional breaths. It was like a yoga class without any movement. 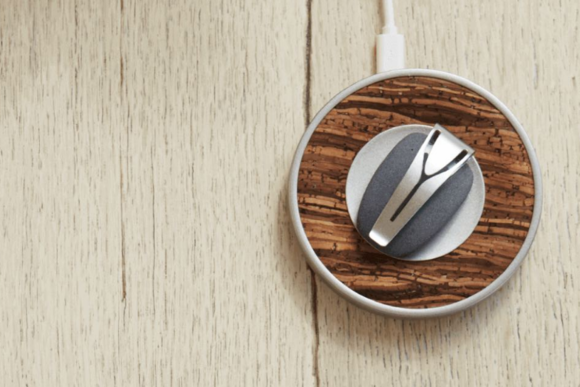 Spire is beautifully designed, and so is its charging puck. I have a few issues with Spire. It takes forever to sync data from the device to your iPhone if you don’t let the Spire app run continuously in the background. (I’m not a big fan of keeping location-tracking apps open to keep my battery alive as long as possible.) But the device only stores six hours of information locally before it’s lost, so if you forget to sync the two, your data disappears. I also wish Spire were a more useful activity tracker. It tracks your steps, active minutes, and calories burned, but it has no clue what kind of exercise you’re doing. You have to manually add a note to each burst of activity. 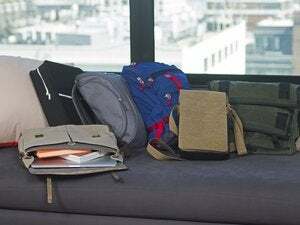 The device also doesn’t track sleep, though Spire cofounder and chief scientist Neema Morajevi told me that’s in the works. It’s also tough to tell if mindful breathing does anything to reduce your stress long-term. Taking control of your breath, which is just one indicator of stress, might not do anything at all to improve your overall mental well-being, though it might feel like it in the moment. I do love Spire’s design (which picked up a Cooper Hewitt National Design Award in 2014). Even the charging puck that comes with the device is Apple-esque. And I appreciate that it can survive a trip through the washing machine if you forget to take it off before throwing your clothes in the hamper. But Spire is $130 (down from $150 when it was released), which is a little expensive for a device with no display. That money could go toward a great fitness tracker. And if you already own an Apple Watch, the release of watchOS 3 this fall puts Apple’s Breathe app on your wrist. It won’t track your breathing the way Spire does, but it will remind you to take time to focus on your mental health, which is Spire’s end goal. Spire is a well-designed device that encourages you to take deep breaths, but I'm not convinced it improves your mental health.